CPA Practice Advisor gives efileSalesTax.com 4.5 stars! "Good for small and mid-sized businesses, or accounting firms managing multiple such businesses, with filing requirements in CA, CO, FL or IL. However, some very large national retail outlets also use the system, particularly for CA and CO"
The 2011 Florida version of efileSalesTax.com will be available February 1, 2011. At this time you will not be able to e-file 2010 Florida returns anymore. efileSalesTax.com wins First Place in the 2011 Reader's Choice Award from CPA Technology Magazine! This is the third consecutive year efileSalesTax.com has earned this honor in the Sales and Use Tax category. efileSalesTax.com now offers an XML filing system that can generate a state-approved XML file that is accepted by the Colorado Department of Revenue. Note: Colorado taxpayers who currently use spreadsheets to file their sales tax will NOT be able to use their current spreadsheet filing methods starting with the September 2010 return (due in October). efileSalesTax.com now offers a Colorado sales tax filing system that can generate a state-approved XML file that is accepted by the Colorado Department of Revenue (DOR). “We’re proud to say efileSalesTax.com has a solution that's affordable and easy to use,” explains Ramon Rochin, CFO, efileSalesTax.com. “The system converts from spreadsheet filing to XML filing quickly and easily at a reasonable price. You only have to buy one component which is a huge savings. Another great feature about our system is there’s no software to install,” added Rochin. “And, it works with virtually any accounting software.”"
CPA Technology Advisor magazine awards efileSalesTax.com 4 stars! "Data-entry screens are simple and easy to understand, and the program provides good linking between related schedules and forms, simplifying navigation..."
"efileSalesTax.com is a big favorite with small and medium sized businesses for filing their California Sales Tax returns, but now even large and multi-location business can take advantage of fast, easy, low cost sales tax filing." "efileSalesTax.com is celebrating its top win in the 2010 Readers' Choice Awards from The CPA"
efileSalesTax.com earns first place in the sales tax category, with twice as many votes as the second place winner. "Sales Tax Paper Filing Option Greeted With Open Arms"
CPA Technology Advisor magazine awards efileSalesTax.com 4.5 stars! "The eFileSalesTax.com system is just so easy to use that most users, even most novice small business owners who hate technology, should be able to use it with little or no guidance or Help." The Board of Equalization has increased sales and use tax rates by 1%, and released a new "split rate" form (401-ASR) which replaces Schedule T. Yearly filers of sales tax for the period ending 6-30-09 will be required to use this new form. "efileSalesTax.com is celebrating its top win in the 2009 Readers' Choice Awards from the CPA Technology Advisor magazine. efileSalesTax.com tied for first place in the Sales & Use Tax category for 2009, pulling ahead of the pack in a crowded category." Nearly 90% of all California businesses that collect sales tax are now eligible to e-file, including business that are required to file Schedules B & C. What are you waiting for? "$45 Million: Why efileSalesTax.com Could Be Your Best New Year's Resolution for Sales & Use Tax e-Filing..."
"efileSalesTax.com is happy to announce that taxpayers in California can e-file their sales tax returns, but still have the option to mail in a “paper check.” For many taxpayers and tax professionals, this is a critical part of their business process." "Whether you are a tax professional filing Florida sales tax returns for your clients, or a business owner filing for yourself, sales tax filing can be a pain. Well, efileSalesTax.com has the solution, offering fast, easy, and affordable sales tax filing. And it’s now available in both English and Spanish!" California Sales Tax e-filing now available to most businesses! The Board of Equalization is expanding e-filing eligibility to over 90% taxpayers in the coming months. CPA Technology Advisor gives efileSalesTax.com 4.5 stars! "eFileSalesTax.com offers a wonderfully simple utility that enables users to file a return in minutes, with the return and remittance handled electronically. The program is geared toward use by businesses of all sizes and professionals serving client businesses whose primary reporting needs are in California, Florida or Illinois..."
Authorized and Approved by the Illinois Department of Revenue. The fastest and easiest way to file Illinois Sales Tax returns. Lowest price of all approved vendors. Product Info. 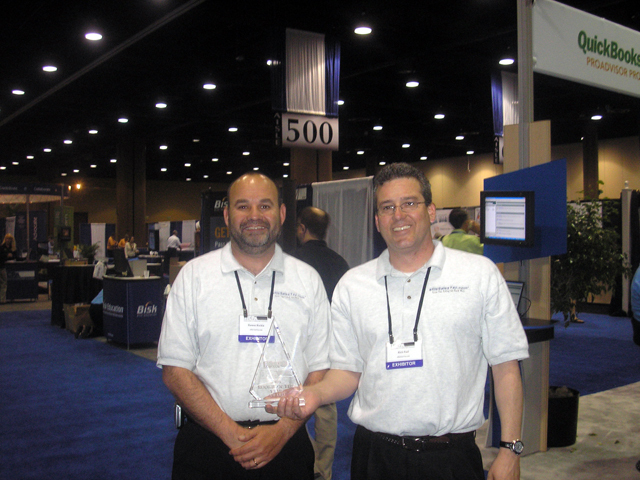 The Florida Institute of CPAs (FICPA) awarded efileSalesTax.com their 'Rookie of the show" award for outstanding performance and presentation at the FABExpo 2008 show in Orlando, FL. Accounting & Tax Pros pick favorites in the CPA Technology Magazine 2007 Readers' Choice Awards. When filing California Sales Tax returns, there are now 2 options for paying the sales tax: bank debit and credit card. efileSalesTax.com offers a quick and easy way to efile your California Sales Tax Prepayments (BOE form 1150). "efilesalestax.com is an inexpensive and very easy-to-use compliance system that is ideal for smaller businesses and accountants who provide sales tax services..."
For businesses required to file California Sales Tax Schedules B or C, efileSalesTax.com now provides a quick, simple, and accurate system for single and multiple location businesses to file their sales tax returns. Accounting & Tax Pros pick favorites in the CPA Technology Magazine 2006 Readers' Choice Awards. Authorized and Approved by the Florida Department of Revenue. The fastest and easiest way to file Florida Sales Tax returns. Lowest price of all approved vendors. Product Info. CPA Technology Advisor gives efileSalesTax.com 4 stars! "efilesalestax.com is very simple to use, with step-by-step guidance assisting users. It requires no training to get up and running. It automatically performs most calculations and alerts users to potential errors..."
We are the only company that can import from QuickBooks to the Sales Tax Return. Available in CA, FL, and IL (coming soon). Tax professionals can setup unlimited clients under a single login. With our streamlined process, most users complete their filings in less than 10 minutes. "Filing tax returns sometimes can be a daunting task with archaic language that often seems other worldly. Try filing tax forms if you are a business owner who primarily has a Spanish-speaking clientele..."
efileSalesTax.com Offers Fast, Easy Sales and Use Tax Filing in English and Spanish.